Canare's 4S11 Speaker Cable 2 Spade to 4 Banana (50') is audiophile quality and handcrafted with Canare 4S11, 11 AWG Starquad cable. Starquad virtually eliminates EMI while offering minimum resistance and excellent frequency response due to low capacitance. This cable is perfect for short or long speaker runs. This hand soldered cable is a heavy-duty locking 2 spade to 4 banana configuration. 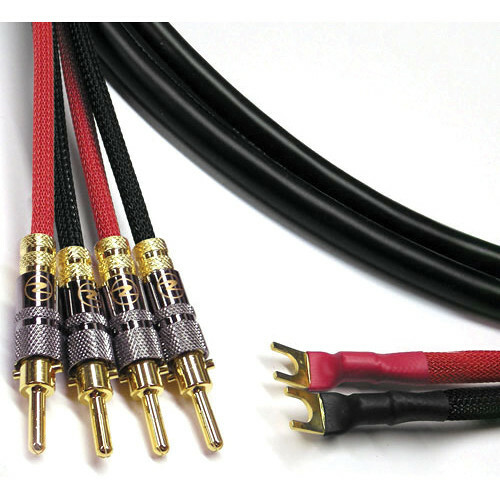 Canare Premium speaker cables are also available with heavy-duty spade lug connectors, and locking banana/spade connector combinations, as well as additional bi-wire configurations, and in bi-amp configurations where the amplifier has 2 sets of outputs and the speaker has 2 set of inputs. Bi-wire and bi-amp versions with banana, spade, and banana/spade combinations. Canare premium Speaker cables are perfect for use with any high-end, high-fidelity stereo speakers that require the best Locking Banana to Locking Banana connections.